NWE3 is designed to work with the BIN patch installed. If you are NOT installing this as a Mini Route, and you have NWE V1 and / or NWE v2 in your ROUTES FOLDER, please delete the older version before installing this version. Please note that activities for the earlier versions will NOT work on V3. 1. The first step is to make sure you have downloaded all 14 files. 2. Once you have them all, set up a temporary folder somewhere on your computer and unzip all 14 files into that folder. 4. Next copy (or move) the GLOBAL, ROUTES, SOUND and TRAINS folders into your Train Simulator folder, overwriting when necessary. 6. Double-left-click on the Installme.bat file and a small window should open and lines of writing will flash past. Make sure that some of these lines read "1 File(s) copied". If they don't there is a problem. Wait until the window disappears. 7 In the folder AA Extras are a tsection.dat file and a DEFAULT folder. If you already have your favourite tsection.dat file and your favourite default.wag installed you don't need these extra files. If you would like to use these, the tsection.dat file is version 44 and goes in the GLOBAL folder and the DEFAULT folder contains a more recent default.wag file. The DEFAULT folder goes in the Train Simulator\Trains\Trainset folder. 9. The files in the ReadMe and Maps folder are also in the Routes\NWEv3.0 folder. Thanks Terry, really looking forward to it. Thanks Terry. I too am looking forward to it. You've shown remarkable perserverence to get this one across the line. Thanks Terry and Bob for that information,I was wondering about the stock for the route,as I knew some had been made especially for this this route. Files are approved and available for download. Thanks Terry just off to start downloading. Thanks ever so much Terry. Will go and download it shortly. All downloaded and installed, I have just finished the Windermere to Manchester airport act in ORv1 (though not quite by the path I was expecting ) everything running perfect and looking great. going to be busy for a while running all the activities. Markh5682 wrote: All downloaded and installed, I have just finished the Windermere to Manchester airport act in ORv1 (though not quite by the path I was expecting ) everything running perfect and looking great. going to be busy for a while running all the activities. Did you not get the pop up message informing you of the route diversion when running the activity? I have run two acts successfully up to now, neither were complicated freight runs but rather the easier passenger runs with little or no pickup or drop off stock (except one drop off at Blackpool with the class 31 run to Blackpool) I'll let you know if I come across any problems with other acts. Yes I did get the message pop up to inform of the route diversion. Well I too now have NWE_v3 installed despite my best efforts to mess it up! I chose to paste a "virgin" MSTS; i.e. just the default routes et al. I carefully copied the relevant folders from the downloads, and ran all the Route Riter checks - several minor errors were highlighted in the CVF and SMS checks, which I duly amended. I should point out that I had renamed the existing MSTS and named the new one to suit. I then opened Train Store and chose an explore mode run, and Train Store then asked if I wanted to overwrite from the stored folders that I had forgotten to unstore when setting up my JPG for the Bulleid coaches . I therefore ended up combining the two MSTS's which meant a lot more stock and routes. In and of itself not a real problem but in order to create a clean Mini Route I will need to start a new install, etc. Of course my first activity for NWE_v3 was the Oldham Loop - what else when you consider I live in Milnrow. Whilst not an exact copy of the area it is still an acceptable representation and I thank Terry for giving us this route with it's connection to my adopted area of England. It was well worth buying a month's UKTS premium membership and spending the morning downloading everything - Rufus was not impressed that it interfered with his routine! I have just completed a leisurely run from Barrow to Carlisle around the Cumbrian coast line, worked perfectly. Had a couple of issues with other acts though, the Little north western steam act loaded OK but I couldn't get the loco to move at all. the other was the Healey mills - Preston - Deepdale act, got about half way through the act and what I suspect was a blocker service wouldn't move, no matter how long I waited. I'll give those two a run in MSTS and see what happens, though I suspect it was OR at fault rather than the acts. Very impressed with what I've seen so far, as Alec said, it's not an exact copy of the real thing, but a very good representation of it. Edit: just tried the Oldham loop act, in OR, after the first station stop, there are no more next station distances displayed, and the path isn't set after the first stop either, it will register the time if you stop at the other stations, it display's that you are -54 mins (early?) but won't do anything else, there is no more traffic running in the opposite direction after the first stop. I was hoping that OR would have solved the activity issues by version one, but it looks as though they still have some way to go. What does concern me though is that although Open Rails gives a much better driving experience, it does appear to be falling down as regards mirroring activity performance. So I'm hoping that the OR guys are aware of the activity performance differences, and are working on a solution? The way OR interprets how an activity runs has been different in MSTS for a long time. I think it is all to do with how OR gives more realistic performances which also depend on the original MSTS files. Player engines can sometimes be impossible to drive in OR - GWR steam engines with their small injector brake release is a good example, whereas ai traffic is more predictable. I have found that some of my activities created for MSTS also work well in OR but others won't. When I created S - Gretna Green_Carlisle for the Glasgow to Carlisle Route I had to make a different version for each sim. I think that the OR team will continue to improve the sim at the expense of complete compatibility with existing MSTS activities. For me, whenever possible, all new activities will be designed specifically for OR making use of the new available functions which might it unusable in MSTS. This is certainly the case with my latest unfinished one. May I add my congratulations to all of the others for such a marvellous route which will give us many years of pleasure. I have posted a link to this thread on Elvas Tower and asked them if thay have any comment on the activity compatibility issues raised here. Could you please elaborate on what you meant by "ran all the Route Riter checks - several minor errors were highlighted in the CVF and SMS checks"? As chief tester for the package, I was striving for perfection. The Class86nt.cvf doesn't appear to be needed, and Front1024.ACE) requires the ) to be removed. I merely copied the missing wav files from elsewhere in my back-ups into the relevant folders. I should add that whenever I install a route I always run Route Riter starting with the Check Route process followed by the 6+2 checks for ENG, WAG, etc. Similarly with new stock. Just as a sample, the Class 31 "missing" files shown on your list are not in my installation, and all the Class 31s operate without errors. The Class 142 front1024.ace files shouldn't have the ) removed! The only thing is that there is no space between the "ace" and ")" , but it doesn't seem to affect my installation. I don't know which part of Route-Riter to run to get these messages, but I would take them with a pinch of salt because, as you've found out, some don't cause a problem because the file indicated to be in error isn't used. I have tried running that coal to Deepdale act in MSTS and I keep getting a "cannot create cab error" with that 37, swapped it out with another similar 37 but still got the error, (the cabview loads fine in OR) have checked all the files are present in common.cab, have even copied the cab files over to the loco folder and run them locally, that usually fixes it, but not this time. I swapped the 37 for a generic blue one and that worked. anyone know what's going on with the included 37s cabview? There's absolutely nothing wrong with the Class 37's cabview - it's aliased to Common.cab/class37-1\class37c.cvf and all files are present and correct. 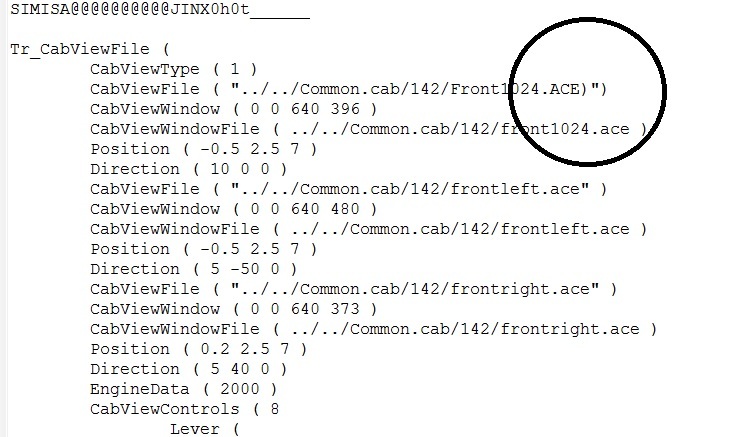 You copied the cabview into the loco folder, but did you change the cvf file used? Are you running the route as supplied, ie as a "normal" MSTS installation? Or have you set up a mini route? Where is MSTS, or the mini route, if applicable, installed? If all is OK with your system, it's possible that it may be struggling to run this route. My MSTS is installed on drive i: (nowhere near program files) I put the route into my standard MSTS (not a miniroute) I changed the CVF and the .eng file to use it locally, you may be right about the system struggling a bit as I have not stored anything from the new route yet, (to leave all acts available to OR) will store the unused acts and stock and then try it again. Markh5682 wrote: I have tried running that coal to Deepdale act in MSTS and I keep getting a "cannot create cab error" with that 37, swapped it out with another similar 37 but still got the error, (the cabview loads fine in OR) have checked all the files are present in common.cab, have even copied the cab files over to the loco folder and run them locally, that usually fixes it, but not this time. I've just checked the Deepdale activity, and all seems a-ok with the cabview. Also, the Shotton-Halewood activity uses the same cab view. Have you tried that? I haven't tried the other act yet, but I'll try the 37 again with everything else stored and see if it was MSTS spitting its dummy out because I had too much loaded. Just tried it again using trainstore, I reset the cabview settings back to their default, but I'm still getting the same error will try making a miniroute and see if that fixes it. I have made a miniroute using a clean install from the route downloads, the cabview loaded as expected so it's working. there must be a bug somewhere in the main MSTS installation that was causing it. It can clearly be seen that there is a ) immediately after the word ACE and then there is " and ). When the file is read it will not find a file Front1024.ACE). Now it may be that the cabview will work but I would rather amend it at this stage rather than find it doesn't. In terms of the WAV files how am I to know whether they are or are not used? There are NO quotes around the file names in the original NWE v3.0 download!! They must have been added by Route-Riter, which shows just how "dangerous" that program can be!! You should never use those six buttons unless you're actually having problems, and even then, backup the folder first. has stated there are no quotes in either line that asks for the Front.ace file. folder which is in the BATS_common_cabs folder into it. slipperman12 wrote: They must have been added by Route-Riter, which shows just how "dangerous" that program can be!! You should never use those six buttons unless you're actually having problems, and even then, backup the folder first. I always use those 6 options in Route Riter and I never have these problems of RR taking it upon itself to change the structure of a file.... Could it be Alec is using the new(er) version over on UKTS? Which might possibly be adding in these quotation marks? I too am going to try this Route tomorrow as a mini-route as I haven't set one up until now! Been playing with Clive's Thames-Trent route the past couple of days!! OR Everything fine and running well until mp25when the Route Monitor shows only a Single yellow ahead,the Level crossing Barriers are up,with Road Traffic still crossing,proceeded staight through,went around L/H bend and rear ended a DMU which was stopped..
MSTS ran the complete Route without error to end. Now I know that Open Rails is going to take over from MSTS,you only have to read the Posts,but not yet !!!!!!!!!!!!!!!! I am using the latest version of Route Riter by Mike Simpson - Version 7.6.26! When I test I use the 6 buttons from Route_Riter but I only use 1,2,4,5 and 6, i.e. I don't check the .sd files that way. I never use those two "Fix" buttons. I like to see what changes are being made. I test the cabviews and sounds using Conbuilder. It checks only the cabviews and sounds used in the locos present in the Trainset folder. On the question of MSTS and OR (note I didn't say MSTS v OR :-) ) it appears that you can write complicated activities that run in MSTS but that won't run the same in OR or you can write complicated activities that will run in OR but that won't run (at all?) in MSTS. Terry definitely created the route and the activities for MSTS so it's not that surprising that some of the activities behave differently in OR. It would appear that I set an unfortunate hare running. 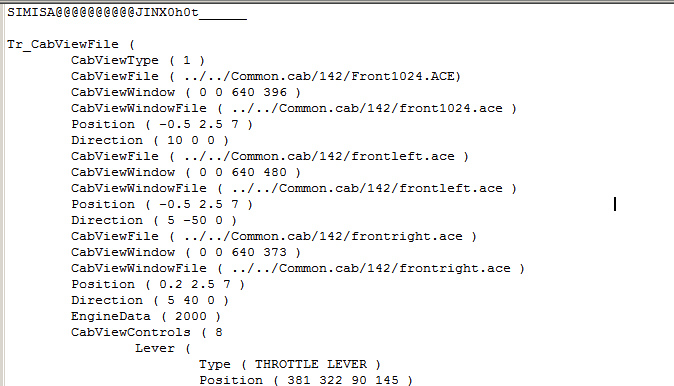 It would appear that the missing space in the 142 cabview folder was treated as an error by Route Riter. Presumably that missing space has no effect on the generation of the Cab View? I may check that later. Despite some potential drawbacks I will continue to use Route Riter as my main means of checking routes, etc. including CabView and Sound folders/files, but will not post any results in case I have misinterpreted the results. I can confirm that all activities were written and tested in and for msts. My activities always utilise a lot of AI interaction, especially to slow the player train down so that the bashers don't run too far ahead , and it is now clear to me that, sadly, OR doesn't simulate a true representation. I am running it from the miniroute, no problems at all I've just done the Oldham loop act and paid a visit to Alec. Really enjoying this route and the acts that come with it, especially since I got my system sorted out to be able to run them all. I'm glad you're enjoying it so far, Mark. I'm really looking forward to feedback on the "challenging" activities, such as the class 40 ICI acts to and from Tunstead, the Trafford park - Basford hall intermodal & the Chlorine Tank trip..
You wrote "My activities always utilise a lot of AI interaction, especially to slow the player train down so that the bashers don't run too far ahead, and it is now clear to me that, sadly, OR doesn't simulate a true representation." I disagree because I think that OR does give a more realistic experience as everything behaves much more as is does in real life. Your activities are like mine in that use a lot of ai interaction, which, when created with the MSTS AE will usually only work as intended with MSTS. I am running your activities with OR so far without too many problems but I won't be complaining if any don't - I shall simply use MSTS as you intended. dforrest wrote: I have posted a link to this thread on Elvas Tower and asked them if thay have any comment on the activity compatibility issues raised here. The problem with the non moving blockers is the MaxPower line in the eng file. I changed mine to 74kW instead of 1hp. Much higher, but now the blocker moves. In the Ghost Train activity, the blocker runs and does its job allowing the AI to arrive and then leave before the player train departs. As has already been said on the atomic forums, OR is not the same as MSTS where activities are concerned. Never has been and I don't think it ever will be. The signalling controls and train physics are much different in the way they are handled. Until we have an OR activity editor these sort of problems will always be happening. I think however that if one sets the AI train efficiency in the MSTS AE to 100 it will produce much closer results. Part of the problem is the consist velocity. I have just looked at one of the electric freight consists and that has a max speed of 44.7 metres.sec,just under 100mph. Based on that I think the missing freight is long past where it is seen in MSTS. Looking at some random consists we have black5_45135_munitions with a max velocity of 100mph. Many diesel freights are set with a 90mph max speed. Where signal and track speed limits allow, OR will run these trains as close to the consist max as possible. If an AI in MSTS passed a restricting signal, max speed was never resumed. This does not happen in OR. Speed limit is maintained until either a track or signal limit increases, then train accelerates again. into my MSTS setup and amongst the common.cab files is a folder called Class421cab. download, I think File ID 1395 which the Cabview uses the same common.cab folder. I checked my original download file to make sure and I was wondering why this Folder is empty. Mine is empty also! From what Bob (L) has said, it doesn't seem to be required. I've had a quick look through the stock and can't find any that use the 421 cab. Does anyone know if changing the "maxpower" line to 74kW instead of 1hp in the blocker .eng files will adversely affect their operation in MSTS? I did the ghost train act in OR and since I updated maxpower in the blocker .eng file, the act worked, I ran it twice actually and got a different result each time, the first time the blocker held up the player train at the beginning of the act, the second time I got straight out of the 1st station with no blocker, but the hold up occurred at Guide bridge instead, quite like that there is some variation in how it worked (whether intended or not) but the end result was the same. I have just completed the new binliner (rubbish train) act, really enjoyed it, (I was running it in OR), the first time I ran it, I was approaching the platforms at Stockport when a DMU suddenly appeared directly in front of me and I rammed it up the backside. (my fault for running too early) The second time I ran it, I slowed down on the main line approaching Stockport to give it time to place the DMU in the platform and give me a red signal on the station approach, after that it ran perfectly Look forward to more quality acts like this one . You then should be held at Woodley Jn whilst a DMU gets the path into the station. You then run yellows following that DMU to Guide Bridge. At Denton, depending on your speeds, you could get held briefly whilst a class 20 coal train exits the single section. At Stockport, you get held whilst both Up and Down IC services get the path in priority. At Northenden, once you pick up your additional rake of binliners, you should get held in the siding whilst a DMU passes. You should get held briefly by a couple of EMU's on joining the WCML. You will then follow one of those EMU's all the way to Runcorn. In fact most of the activity will be spent running yellows, with it being virtually impossible to actually reach the 60mph speed limit. The DMU actually appears in the Stockport platform, if I get there too quickly and get a green light through Stockport station, the DMU suddenly appears just as I reach the platform, not a problem as I just time it to arrive at Stockport a little later and by then I'm checked by a red signal before I run into the DMU, it runs fine in OR as long as you take that into consideration, as you say most of the act is riding the yellows, a nice act all round. I'll run it in MSTS and see how I get on with it.